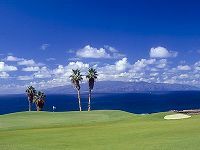 Tenerife is the leading Golf destination of the Canaries, enjoyable all-year round, and especially favourable to golf in the winter months of November to February with average temperatures between 20-26ºC (70-80ºF) daytime. The main tourist areas in the south of the island are at the lively Playa de Las Americas, the quieter Los Cristianos with Arona Gran Hotel, and the upscale and refined Costa Adeje, home to Hotel Jardin Tropical and Sheraton La Caleta Resort and Spa. The golf courses are more than enjoyable, including former European Tour venues Costa Adeje and Amarilla less than 10 minutes from the main resort areas.